This lovely one bedroom brings the seascape indoors. It is perfect for singles, couples, or a small family with one or two children. The recreation-minded will appreciate our unique rinsing and drying area for wetsuits, bathing suits and towels. Our low-rise complex features a swimming pool, hot tub, outdoor shower, BBQ, elevator, and a large coin-operated laundry room. Step out to direct beach access and 15 miles of boardwalk along the beach and bay. Everything you need is a short walk away, including grocery stores, restaurants, coffee stands, shops, bike and surfboard rentals, bars, and a pier. 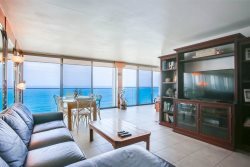 Inside the condo you can enjoy two large flat screen TVs with cable, WifF, DVD player, and a music station. There is one king bed and a queen sofa-bed to accommodate 4 people. You will have a peek view of the ocean and pier from our second story bedroom window. The fully equipped kitchen includes a dishwasher, microwave, coffee maker, crock pot, toaster oven and a blender. You will have all the beach accessories, such as beach towels and blanket, body boards, cooler, beach toys, volleyball, and beach chairs. Our unit also has a dedicated parking spot so you'll have no trouble parking at the beach. Unpack, unwind, and enjoy your Beach Abode.